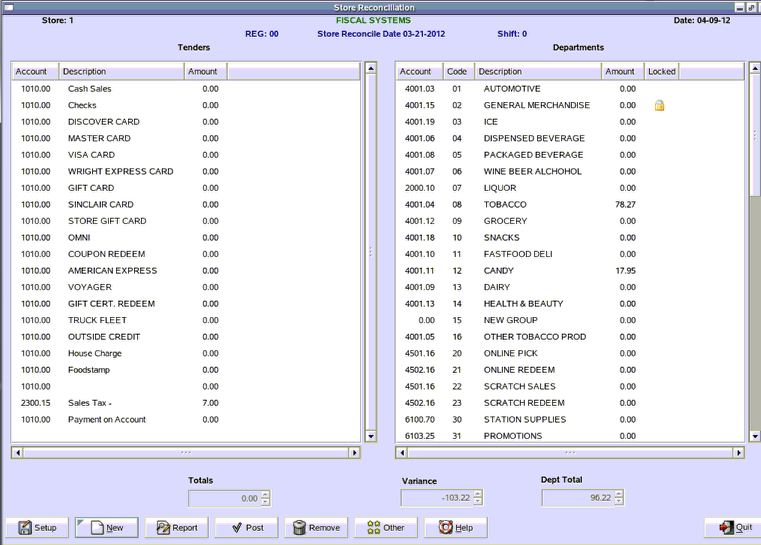 TravStar1 Point Of Sale SystemManager's Work Station Daily ProceduresHow Do I Run the Store Reconciliation? This lesson will teach you how to run the Store Reconciliation. From the Daily Procedures tab, click on the "Store Reconciliation" button. The Store Reconciliation is a compilation of the entire cashier till declaration. It is used to balance the stores books for each day. From the Store Reconciliation screen. click on the "New" button. From the Select Options screen, click on an option. The recommenced method is by date. Then click on the "OK" button. 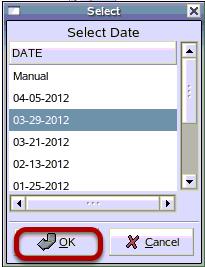 Click on the date you are reconciling, then click on the "OK" button. 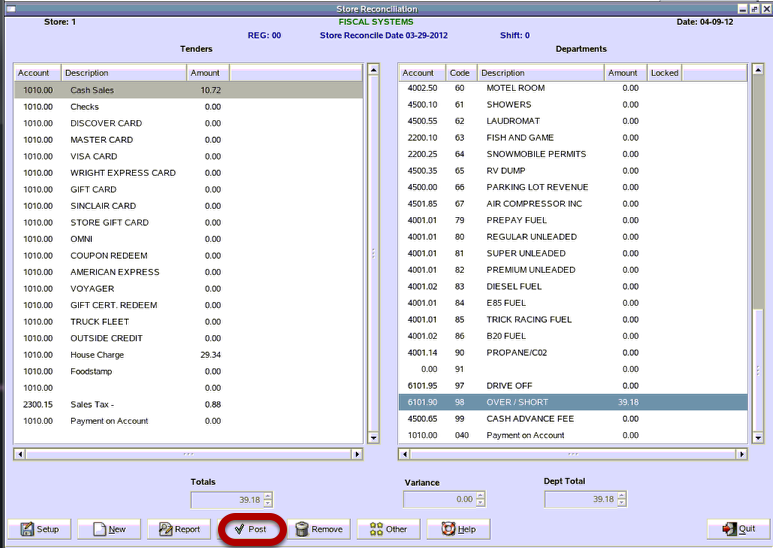 Tender totals are displayed on the left hand side of the screen, while Sales, broken down by department, are displayed on the right side of the screen. 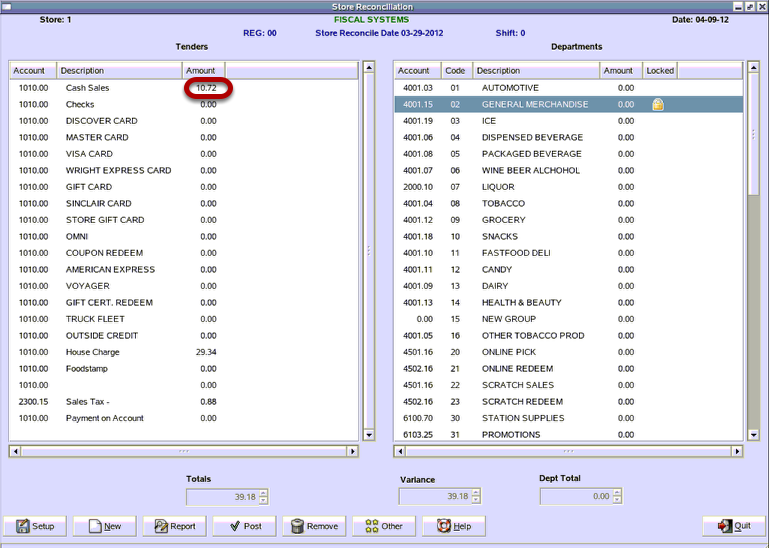 The Total amount of money taken in is displayed at the bottom of the Amount column of the Tenders side of the screen, while the Total amount of sales is displayed at the bottom of the Amount column of the Departments side of the screen. If these total amounts are the same, you may proceed to post to the store reconciliation. If these amounts are out of balance, adjustments must be made. 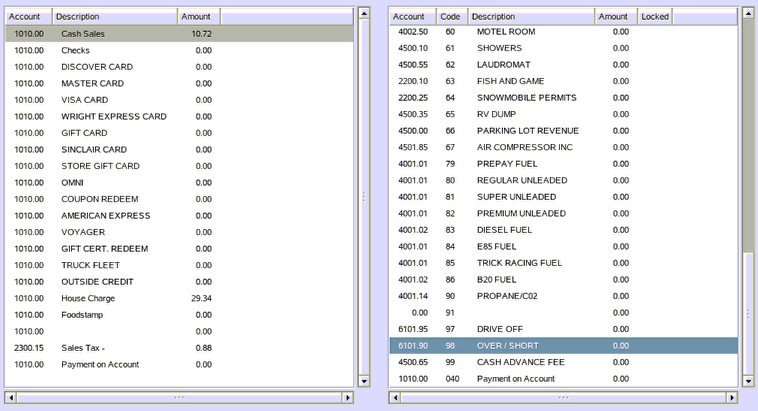 Click inside the Amount column on the Tenders side for Cash. Then press the enter key. You may enter your deposit amounts into this screen, then click on the "OK" button at the bottom of the screen. The new total will then be displayed into the cash sales Amount column. Note: The Deposits screen can only be accessed from the cash sales Amount column. To adjust a variance, click on Over/ Short and type the vaiance in the Amount and press the enter key. The system will assume the decimal point and two zeros if not entered .00. Notice that each time a change is made, the total changes by the amount of the change. Note: If variance is negative, then the Over/ Short department should also be negative. If variance is positive, then the Over/ Short department should also be positive. In this example, there in a variance of $39.18 for the day. Adjustments can be made in the over short department. Notice the Variance is now $0.00. 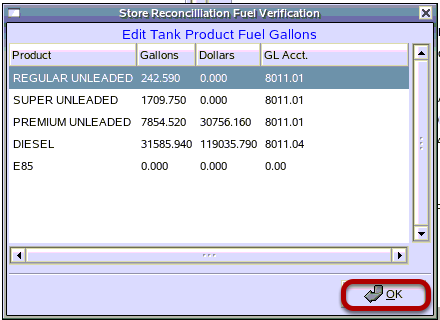 When the balances in the Store Reconciliation screen are reconciled, these totals may be posted to the General Ledger Account. To post amounts, click on the "Post" button located at the bottom of the Store Reconciliation screen. 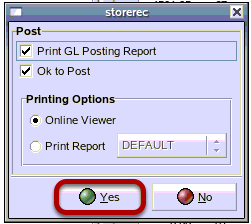 It is recommended to always print the GL Posting Report and to also view the report online before printing. Click on the "Yes" button. Confirm fuel gallons then click on the "OK" button. Here is an example of the GL Posting Report. Click on the "Print" button to print the report, then click on the "Quit" button. If the Variance is not equal to $0.00, then you will see this error message after closing the GL Posting Report. Click on the "OK" button, then fix variance. If the Store Reconciliation has already been posted, you will see this Question screen. Click on the "No" button to cancel and not post or click on the "Yes"button to override the original post. Click on the "OK" button. The Store Reconciliation has now been posted. If the Store Reconciliation is opened before all shifts are finished, then you will need to reprocess records for that date. From the Store Reconciliation screen, click on the "Remove" button, then click on the "Yes" button to confirm and remove all records. Prev: How Do I Declare Cashier Tills? Next: How Do I Run an End of Day on the Manager's Work Station?